« How Much Money Do You Need to Save for Retirement? The longest U.S. government shutdown in history laid bare an uncomfortable truth: Americans aren’t saving enough and the majority of us have no rainy-day fund to protect us when the inevitable you-know-what hits the fan. More than 70% (!) of all types of employees at all income levels surveyed live paycheck to paycheck and said they’d have difficulty meeting their financial obligations if their paycheck were delayed for just one week! That’s according to the 2018 “Getting Paid in America” Survey by the American Payroll Association. … the worker who had to rely on food banks to feed his family and take out payday loans – at interest rates of 390% to 780% APR! Here’s the thing – emergencies are just that. You don’t get a warning that one is coming. If there’s one thing you can know with absolute certainty, it’s that the unexpected will happen! Think about it. Over the last 5 years, how many times have you run into an expense you hadn’t anticipated? Maybe your roof needed to be replaced, your adult child or aging parent needed help, you got hit with a tax bill you didn’t see coming, or a family member or pet had a health emergency. Or maybe you lost a job or had your hours cut. Or you had a job opportunity that required you to relocate across the country and you needed money to finance the move. During the Great Recession, 5-1/2 million Americans were out of work for more than six months. The average length of time it took workers to find a job was eight months! How would it affect your family if you lost your job tomorrow? But if you already feel pinched just trying to make ends meet, how the heck do you get to having a stash of cash equal to at least one year of your income saved up? Step 1: Do an audit of your credit card and checking account statements for the last three months. How many recurring charges of $10, $20 or $30 are you paying every month for services you rarely if ever use or don’t really need? I recently did an audit of both my business and personal account statements and was surprised by how we were being nickeled and dimed to death. I’ll bet you’re paying for stuff you don’t really need or want… or don’t even use, too! Be ruthless and cancel them all! Put the brakes on impulse buying by setting up a 24-hour or seven-day rule. This means that except for your truly basic necessities, you’ll wait 24 hours before making any small purchases. If after 24 hours that item still seems like a great idea, you can buy it. For larger purchases, you’ll wait seven days before making the purchase. And for major purchases like a car, wait 30 days. Try this and you will be shocked at how often you decide you really don’t want that item after all. Try spending only cash – you know, that green stuff! – for a month. No debit cards or Apple Pay or Google Wallet purchases (two of the most ingenious ways ever invented to separate you from your hard-earned money). Studies show you’ll spend 20% less on average when you pay with (real) cash! Try curbing the impulse by flexing your bicep or making a fist as you’re considering a purchase. Sounds strange, but it actually often works! Step 3: Look at your daily habits. Grabbing lunch at a fast-food or other restaurant adds up. It’s also usually not as healthy as bringing your own lunch. Can you really afford to buy that $5 (plus tip) Starbucks coffee every day? Please don’t shoot the messenger, but if you don’t have a sizable emergency fund, you can’t afford it. What’s the Best Place to Save Money You Need to Keep Safe and Liquid? And you can use your money and have it continue growing as though you hadn’t touched it! I’ve discussed why so many people agree that Bank On Yourself policy loans are the “8th Wonder of the World.” But don’t take my word for it. Read these 21 heart-warming stories of how having quick access to cash in a pinch from their Bank On Yourself plans saved them from financial disaster and enabled them to take advantage of opportunities. What other savings or financial strategy do you know of that gives you all these advantages? 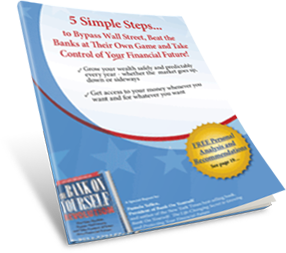 Only the Bank On Yourself safe wealth-building strategy does. But the key, of course, is to get started building your emergency fund TODAY – before you need it! It’s easy to find out how adding Bank On Yourself to your financial plan can help you reach both your short-term and long-term financial goals and dreams. Just request your FREE Analysis here right now, if you haven’t already.